Every now and again I feel like I need to share the great things I’ve scoffed recently and the last couple of months have been top notch for food. Here is why. Sometimes you’re walking around the Merchant City Festival, not looking for food at all, simply enjoying some samba music in the streets and you come across a gluten free bakery stall. Now, most gluten free baked goods have eggs in them to help the flour rise so the babes at Wild Flours had loads of gluten free goodies including brownies, cupcakes and wait, what’s this? A VEGAN GLUTEN FREE CUPCAKE. I bought two. I have no chill I know. This cupcake was perfect. We all know that I love doughnuts, remember when I was hungover to hell at Vegan Connections and the only thing getting me through it was the thought of eating a Considerit Chocolate doughnut? Well a few weeks before Vegan Connections I found the Considerit Chocolate doughnuts in the Grassmarket in Edinburgh and oh my goodness, their oreo doughnuts are easily one of my favourite things to eat. Note that it is bigger than my hand. One sunning evening in August my friend and I went along to Kelvingrove Bandstand to scream at the one and only, Sir Tom Jones. I have no shame, it was amazing, he always is (no it’s not the first time I’ve seen him and it’s not the last). Anyway, the food. I assumed that I’d need to settle for chips with a pint of cider but to my utter delight the food at the bandstand was being supplied by Whole Foods! Ok so there wasn’t technically a vegan option, but the bean nachos could be made vegan by removing the cheese and sour cream – get in! That may sound boring as hell but I can assure you it was so damn good. Nakd bars are great, for breakfast, a mid-morning snack or something to scoff on the way to the gym, they are healthy and convenient. Controversially, I am so not into the peanut delight… I would much rather have a spoon full of peanut butter – soz! The lovely people at Soupologie have branched out from hot soups into these delicious cold soups that are just like lovely smoothies. This apricot, almond and coffee is bloody wonderful, perfect little pick me up for a busy morning. After the ordeal that was OUTrun, me and my running friends headed to Left Bank in the west end for a well deserved feed! Usually before I go anywhere to eat, I do some research but let’s face it after a 5 mile run I’d have been happy with a gin and a bowl of chips. 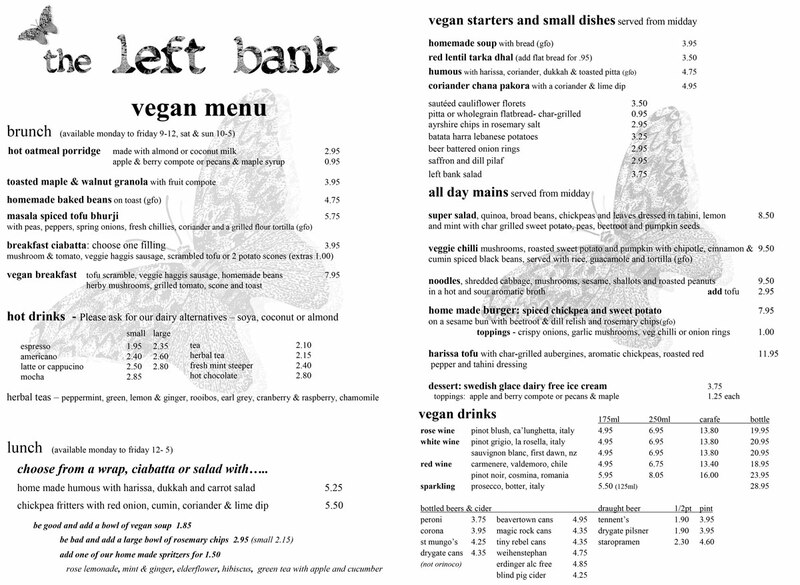 Thankfully, Left Bank have a vegan menu – hurrah! So the vegan breakfast at the Left Bank includes tofu scramble, veggie haggis sausages (which were so damn good), homemade beans, herby mushrooms, potato scone, grilled tomato and toast.